Pools Vs Swim Spas; Which One Should You Choose? With the rise in popularity of swim spas over the last few years, many families looking to buy a pool for the first time are faced with a decision; should they buy a more traditional in-ground/ above ground pool, or should they get a swim spa? The answer depends on the situation. Both traditional pools and swim spas have unique benefits and drawbacks. Today, we will explore the advantages and disadvantages of pools and swim spas to help you decide which is right for you and your family. Factor 1 – How Big Is Your Backyard? The size of your backyard is a big factor in determining what kind of pool you should buy. With lots getting smaller and smaller there is simply no room for traditional pools in some backyards. In these yards, a swim spa might be the only kind of pool that can fit. 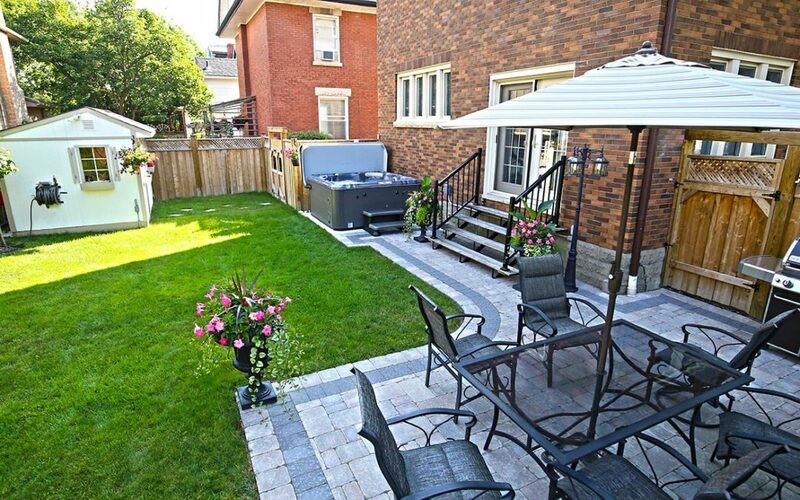 For medium to large sized backyards, consider what other outdoor activities you would like to do. Do your kids have a play structure? Do you have a garden? Do you want to leave room for outdoor sports / games? Do you need room for pets to run around? Keep things like this in mind and make sure that a full sized pool can still fit in the space that remains. If they can’t you might need to look at a smaller pool or swim spa. Verdict: If you have a small backyard, swim spas make much more sense. If you have a large backyard, you could get either one. 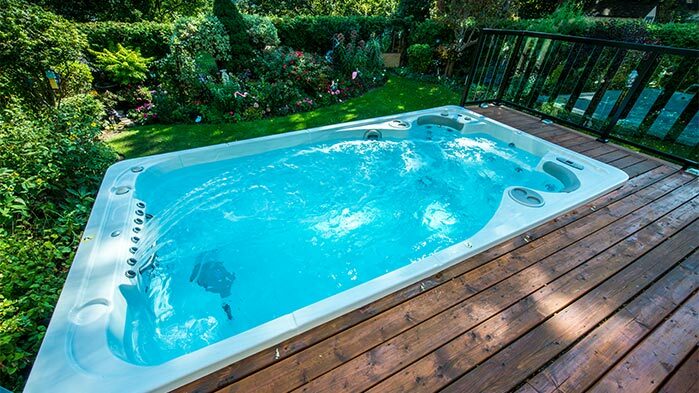 Swim spas are ideal for homes with small backyards. The purchase cost of the pool. The installation costs of the pool. When it comes to purchase price, swim spas are priced between above ground pools (typically $6,000-$10,000) and in-ground pools (typically $40,000+); selling for between $20,000-$35,000 on average. When it comes to installation costs, in-ground pools are much more expensive than both above ground pools and swim spas. This is because they almost always require landscaping and fencing that complies with local pool regulations. We recommend budgeting at least 50% of the purchase of the pool to cover permits, installation and landscaping costs. To install a swim spa only requires a simple electrical hook-up with a dedicated GFCI (~$1000-$1500) and a poured concrete pad (~$1500-$2500), making them much closer to the install cost of above ground pools. While you can fully or partially bury a swim spa to get the in-ground pool look, this it totally optional and can be done later to spread costs out over a few years. Verdict: For smaller budgets ($10,000-$15,000 or less), an above ground pool makes the most sense. For mid sized budgets ($15,000-$40,000), a swim spa or small in-ground pool makes the most sense. For larger budgets ($40,000+) you can really do whatever you want! Along with the purchase cost, you also should consider the running costs of your new pool. To move all of the water in a traditional pool requires a large pump. Large pumps means large energy bills. Above ground and in-ground pool pumps generally consume around $2-$3 of electricity per day. Heating all of that water isn’t cheap either. Heating bills for in-ground pools can easily reach several hundred dollars per month once the summer heat begins to die down ($5+ dollars per day). Due to the smaller swim tank and built-in insulation, swim spas are able to run their pumps and heater for between $1-$3 per day depending on the time of year; less than half of what it costs to run an average in-ground pool! Verdict: Swim spas are much cheaper to run than traditional pools; especially if you plan on heating the water. Another factor that separates swim spas from other pools is the time it takes to install them. Above ground pools typically take 1-3 days to install, fill and get running properly. In-ground pools generally take between 7-21 days to install, fill and get running properly; depending on the finish and size of the pool. Both of these projects can also be delayed by weather, by permits, which usually take a week to be issued, and by final inspections, which can delay you another few days. Add to that the time it takes to complete your landscaping and most new pool owners lose half of their swimming season in the first year that they own the pool. Swim spas, on the other hand, can be installed in as little as a few hours and are generally ready to use in under 24 hours. Verdict: Swim spas are much faster and easier to install. They are also much easier to move if you don’t plan on staying in the same house long term. The length of the swim season is another thing to consider. In Ottawa, the average swimming season is short, usually no more than 4-5 months. 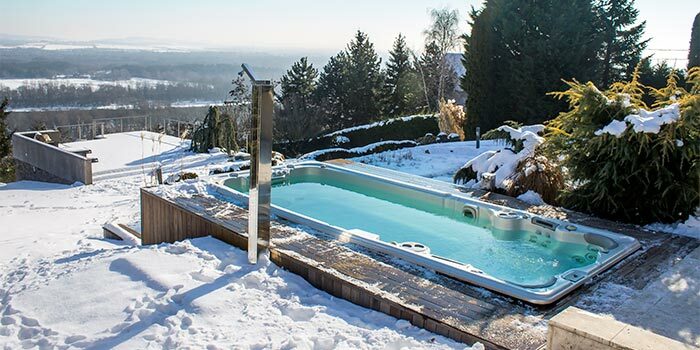 While you could get a heater for your pool to extend the season out to around 6 months, the cost of heating an average pool is quite high; easily costing several hundred dollars per month once overnight temperatures begin to drop. A swim spa, on the other hand, is insulated against the cold and has a built-in heater. For this reason, you can very easily extend your swimming season to 8 or 9 months of the year, with some swim spa owners keeping their swim spas open all year long. Verdict: If you want to extend your swimming season from 3-4 months to 6-12 months of the year, a swim spa is the much more cost effective choice. 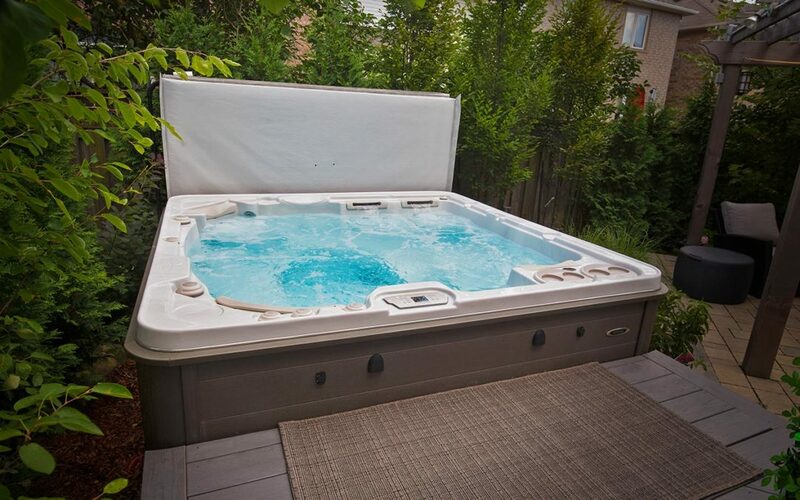 Due to their small size and added insulation, swim spas are able to easily run year round at a relatively low cost. Maintenance is another factor to consider when deciding between a swim spa and a pool. Brushing the surface to discourage algae growth. Skimming the surface of the pool to remove leaves and other floating debris. Vacuuming the bottom of the pool to remove dirt and other heavier debris. If you own a swim spa, however, much of this maintenance is not needed. Since they have a much smaller surface area than a standard pool, the filtration system in a swim spa is easily able to filter out any floating debris that lands on the water. The acrylic surface of a swim spa shell is also anti-microbial, meaning that you won’t have to worry about brushing it. Self-Cleaning swim spas from Hydropool also include a floor vacuum so you don’t have to worry about vacuuming out the bottom of the swim spa. This means that with a Self-Cleaning swim spa, your weekly maintenance is simply adding a couple of chemicals to the water. Verdict: Swim spas, especially Hydropool’s Self Cleaning swim spas, are much easier to maintain then traditional swimming pools. One of the biggest reasons why people buy pools is the fun & fitness aspect of it. This is also one of the biggest factors to consider when deciding what kind of pool to purchase. Simply put, the larger your pool is, the more people are able to comfortably use it at the same time. If you’re planning on having a lot of people over to use the pool on a regular basis, purchasing a larger pool makes sense. If on the other hand the pool is just for your family, size makes less of a difference as even the smallest pool or swim spa can fit 3-4 people. If you’re buying a pool for fitness rather than for leisure, swim spas offer some unique advantages. Their built-in current systems provide you with a consistent current to swim against that can be varied to match your skill level. The only other option when looking for a fitness pool is to go with a large (preferably rectangular) in-ground pool. Trying to do laps in a small to mid sized pool can be very frustrating as by the time you push off the wall you might only get a few strokes in before having to turn back again. Verdict: If you want to have a ton of people over for a pool party, traditional pools might be the better way to go. If the pool is just for you and your family, you could buy either a pool or a swim spa. If you’re looking for a fitness pool a swim spa or large in-ground pool is probably the best choice. Those looking for a fitness pool can also buy aqua fitness packages with their new swim spa. More and more people in the Ottawa area are buying swim spas instead of more traditional pools. This isn’t to say that swim spas are always a better choice however. When comparing standard pools to swim spas it is important to understand that both have unique advantages and disadvantages. What you buy should depend on both your budget and how you plan on using the pool. 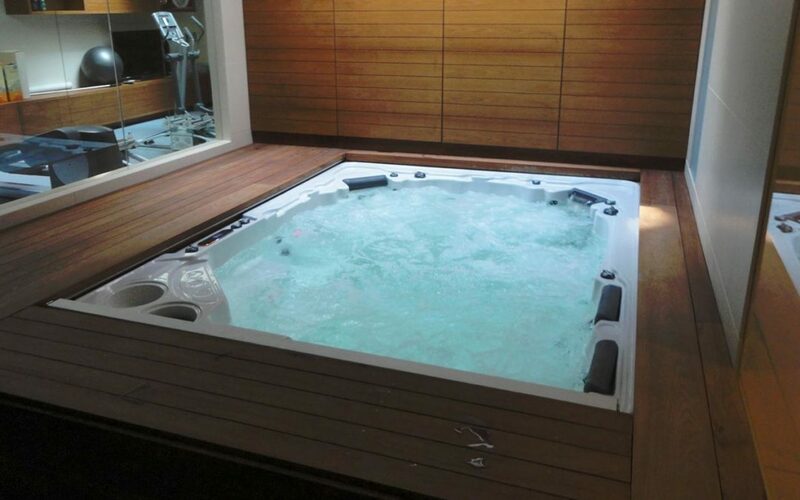 Visit our showroom today to see our amazing selection of hot tubs and swim spas. Ready for the Ultimate in Relaxation? 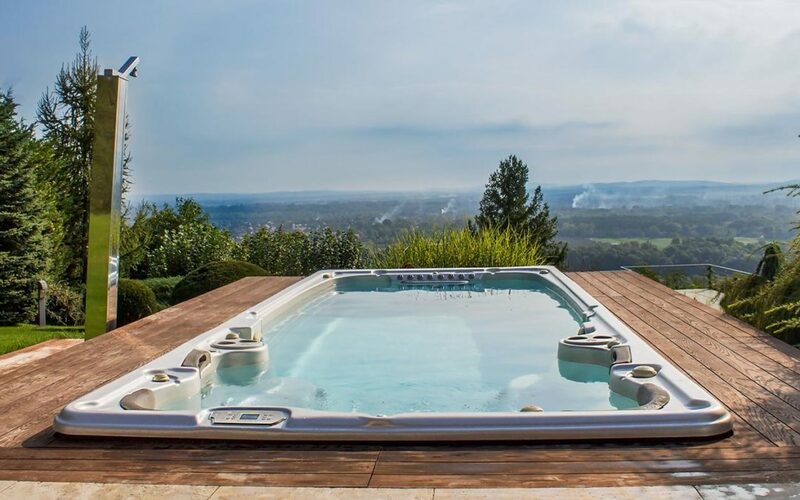 If you need a quote on a new hot tub or swim spa, or for one of our many services, don't hesitate to contact us.